Active learning strategies and self-directed learning (SDL) are becoming increasingly important in medical education. Students should develop SDL skills to make sense of the increasing amount of new information and to be prepared for practice. The number of new drugs and therapies are constantly increasing in pharmacology and staying abreast of recent developments remains a challenge for the practicing physician. 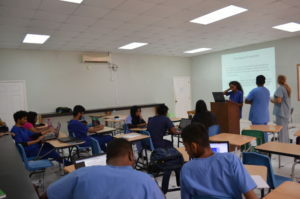 A flipped classroom is where students do the required reading before the class and use the class time to analyze clinical scenarios, present their therapeutic solutions and management options. The classroom time is used for group discussion and problem solving strengthening SDL skills. On Tuesday and Wednesday (5th and 6th June) two flipped classroom sessions were held in Pharmacology. At present the Musculoskeletal system is being covered and the topics for the two sessions were ‘Drug acting on the skin and treatment of leprosy’ and ‘Pharmacotherapy of gout and rheumatoid arthritis’. The slides were shared previously with the students and students have full access to the online library. Students worked in small groups to solve the clinical problems and address the questions posed to them. They presented their group work to the class and the facilitator highlighted important issues and discussed topics and concepts which he felt needed further explanation.